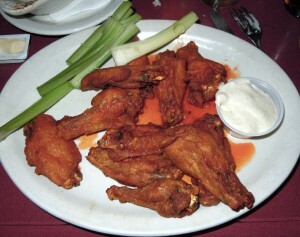 February 2011: While passing through Buffalo on a recent trip, it’s only natural to stop and get some Buffalo wings. Since they were invented in this town, I figured that there’s no better place to get them than Frank and Teressa’s Anchor Bar. It was in this very bar where a piece of scrap chicken meat was turned into food gold. When you enter this place, it seems pretty busy. Not only busy as in lots of people, but busy as in there’s lots of stuff all over the walls. It’s just a busy place. We were immediately greeted and seated by a friendly guy. After several minutes of waiting, our waitress eventually showed up for our drink orders. I ordered a birch beer (it’s a variety of root beer they had on fountain), and of course my coworker (being an alcoholic in denial) ordered an actual beer. We ordered what everyone orders here. Wings. Well, technically only I ordered Buffalo wings. My coworker ordered some BBQ ones. 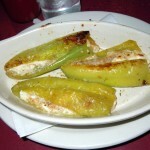 We also ordered some stuffed banana peppers, which seem to be quite popular in the area. 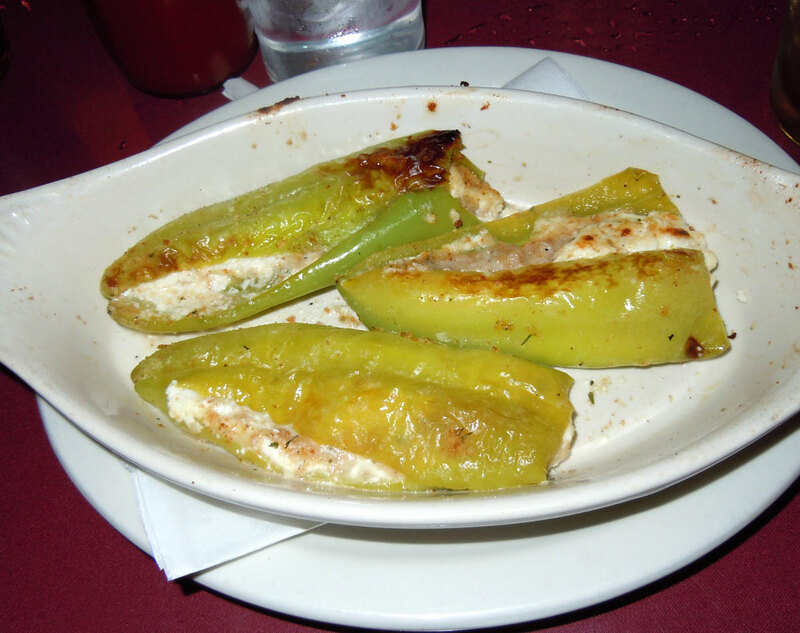 The banana peppers arrive and we were not impressed to say the least. They were small, and had barely any stuffing. At $10 for 3 of them, they were definitely disappointing. Finally, the main attraction arrived: the wings. They were plopped down, and my drink was refilled for the first time since we arrived. (Side Note: The online menu says that soft drinks are $1.50 and there are no refills. They seem to have amended the policy by raising the price to $2.75 and giving you free refills. In an hour long visit, I got ONE refill.) The wings were fried to crispy perfection. They were just the way I like them. The sauce, however was not the way I like it. There wasn’t much of it on there. There was a pool of it on the plate, but it was mostly oil. Too bad. I’d have ordered extra sauce, but the waitress was nowhere to be found. 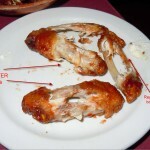 If she had come back, we might have complained about the MONSTER chicken bones posed as wings we received. When you’re paying $11.00 for 10 wings, they had all better be top notch. 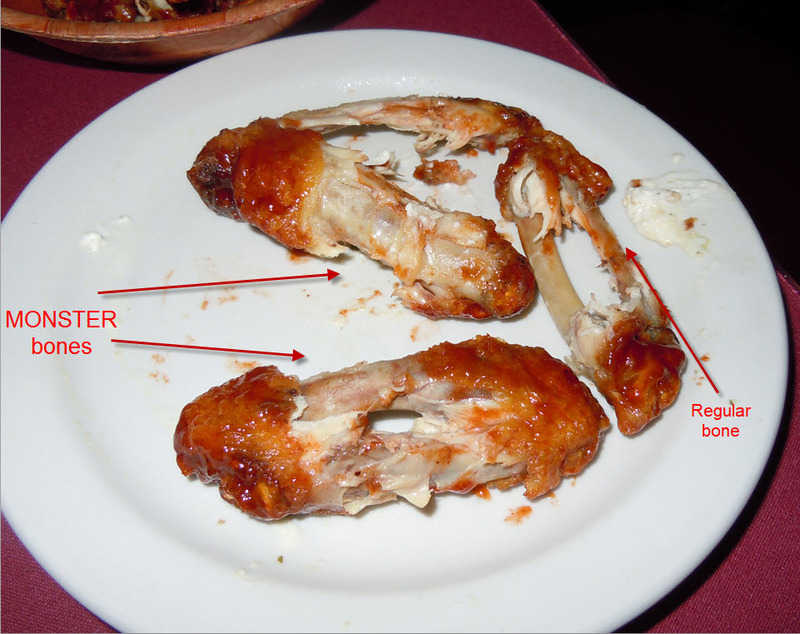 Two of his ten wings (value of $2.20) were skin and bones (literally). I’ve included a side by side photo where you can see a regular bone next to these monster bones. Several minutes later (while my glass was still empty), the waitress arrived again to ask if we wanted anything else. We wanted to try a few cannolis, so we ordered them. She brought desserts and the check. The cannoli was ok. Nothing special. It was kind of dry. Sure wish I had a drink… Anyhow, we paid the bill and split. They had a great idea with those wings, but many other places have improved on the concept at this point. If you’ve never been there, you’ve got to go and try them, but other than that, it was a one time shot for me.